Following hot on the trail of the raft of recent papers that I highlighted on the blog last week comes a new study by Andre Gilburn and colleagues entitled “Are neonicotinoid pesticides driving declines of widespread butterflies?“. The paper is open access and published in the journal PeerJ which encourages post-publication comments and review of the work. I see that Tom Oliver of the Centre for Ecology and Hydrology has started the ball rolling with a couple of questions, and hopefully more will follow, with responses from the authors. The paper focuses on the fact that between 2000 and 2009 there was a 58% decline in butterfly abundance on farmed land in the UK despite a doubling of spending on conservation in the UK over the same period, much of it on agri-environmental schemes on that very same farmed land. The authors don’t directly answer the question but it seems to me to be quite an important one to answer because abrupt changes in rates of decline in the abundance and diversity of species can be linked to broader changes in, for example, land management and agricultural practices, as we showed recently for bee and wasp extinctions in Britain. I’ve marked the point at which neonicotinoid pesticides were starting to be widely used in UK farming with a black line. As you can clearly see this is also roughly the point at which the abundance of the 24 “Species of the wider countryside” begins to trend downwards. In comparison, the 26 “Habitat specialists” show much less of a change, and in fact their initial decline was much earlier (in the 1970s-80s), possibly in response to loss of species rich grassland and ancient woodland. Of course I’m just eyeballing the data and it needs to be tested statistically to see if there really is a break point in the trend at the mid-1990s, but this ought to be possible for anyone with access to the full data set. Even if this is shown to be the case it’s all correlative (as Gilburn and colleagues acknowledge) and proving causation is difficult. Nonetheless it looks to me like there’s an interesting smoking gun here that deserves further study. The Parliamentary Office of Science and Technology (POST) has organised a “Pollinators Update” afternoon seminar in London on Wednesday 2nd December, to discuss recent developments in pollinator conservation research. I’ve been asked to give a 15 minute presentation on the pollinator extinctions research we published in Science last year. The seminar is free to attend but you need to book a place: see the POST website for details. The question of whether or not neonicotinoid pesticides are negatively impacting agricultural pollinator abundance, diversity and behaviour continues to focus the minds of researchers. It’s an issue that has been almost constantly in the news since the earliest suggestions that these pesticides were harming pollinators. These concerns have led to temporary EU restrictions on the use of these chemicals, a decision that was partially over turned this year in the UK. The past two months has seen the publication of at least five papers on the topic, two of them this week alone. In this post I want to highlight those papers and provide some commentary. Stanley et al. 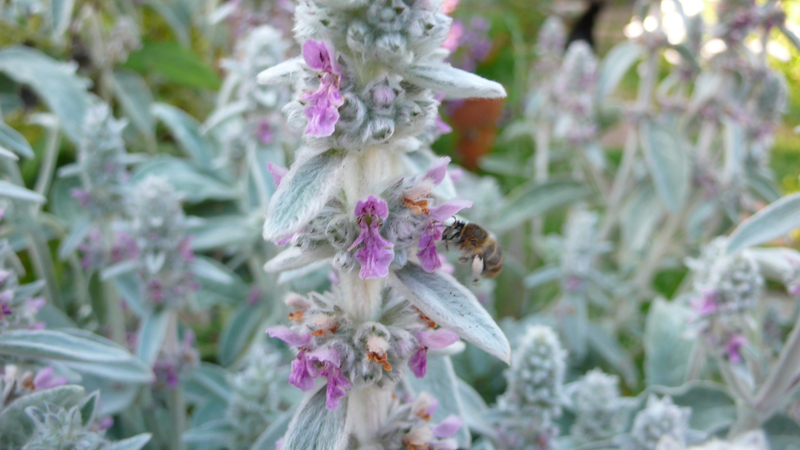 “Bumblebee learning and memory is impaired by chronic exposure to a neonicotinoid pesticide“. Stanley et al. “Neonicotinoid pesticide exposure impairs crop pollination services provided by bumblebees“. The study is the first one to my knowledge that tests the effects of field-relevant doses of pesticides on pollinator performance and subsequent pollination services in a commercial farm crop, and adds some valuable hard data to an already heated debate. The story, embargoed until this evening, has already been picked up by media, including the BBC News website. To summarise the study: using artificial bumblebee colonies and caged apple trees Stanley and colleagues implemented an experiment in which they tested the effect of two different levels of exposure to a neonicotinoid pesticide on pollinator behaviour and subsequent pollination services to the fruit trees. They found a clear effect of exposure to the higher level of pesticide, resulting in a change in bee behaviour and a subsequent reduction in apple quality. By way of a contrast, another study this week has focused on the lethal effects of these pesticides. Henry et al. “Reconciling laboratory and field assessments of neonicotinoid toxicity to honeybees” has shown that although the chemicals are lethal to individual honey bees, the overall impact of the loss of the bees is buffered by the fact that the colonies can simply produce more worker bees to compensate for the losses. This is interesting but needs to be judged in the context of the fact that honey bees are very unusual and atypical compared to most other pollinators, and indeed most other bees. They produce very, very large colonies with a unique social structure, and so this compensation might be expected. These caveats were echoed by some of the scientists asked to comment on the study in media stories such as the one on the BBC News website. Finally, Godfray et al. have updated their earlier review of the environmental effects of these pesticides with “A restatement of recent advances in the natural science evidence base concerning neonicotinoid insecticides and insect pollinators“. Given the rate at which new studies are coming out, it won’t be long before a second restatement is required! Where does this leave the whole debate around pesticides? Still with firmly entrenched views on both sides I would have imagined. No doubt the debate will run and run. Meanwhile, important as it is, the focus on pesticides is in danger of over-shadowing other really interesting studies that might affect how we manage our agro-ecosystems in the UK. For example, I’d completely missed a paper from the end of September by Pywell et al. entitled “Wildlife-friendly farming increases crop yield: evidence for ecological intensification“. As far as I can judge from the Altmetric information for the paper, so too had the media: it received no coverage on any of the usual outlets. But this is important stuff that deserves wider publicity: it’s going to take more than a ban on pesticides to recover some of the biodiversity (at both a species and a habitat level) that we’ve lost due to intensive farming over the last 100 years or so. What’s wrong with the New Scientist story about “Bumblebees deployed to spray crops with pesticides”? The accompanying image is of a honey bee, not a bumblebee. Bumblebees have nests, not hives. It’s a dumb idea. For a whole set of reasons, some of which are mentioned by scientists who were interviewed for the story. I’d add another one: these bees will visit a lot of other flowers besides the ones that are being targeted, potentially spreading the bio-control fungus far and wide in the environment. Is that really a good idea? Two of these things are within the control of New Scientist. Thanks to my colleague Dr Wanda McCormick for pointing out the story. 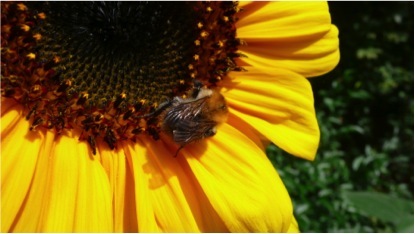 A new bee for Northamptonshire! Back in the summer I produced a series of posts for Pollinator Awareness Week highlighting the pollinators to be found in our own urban garden in Northampton. 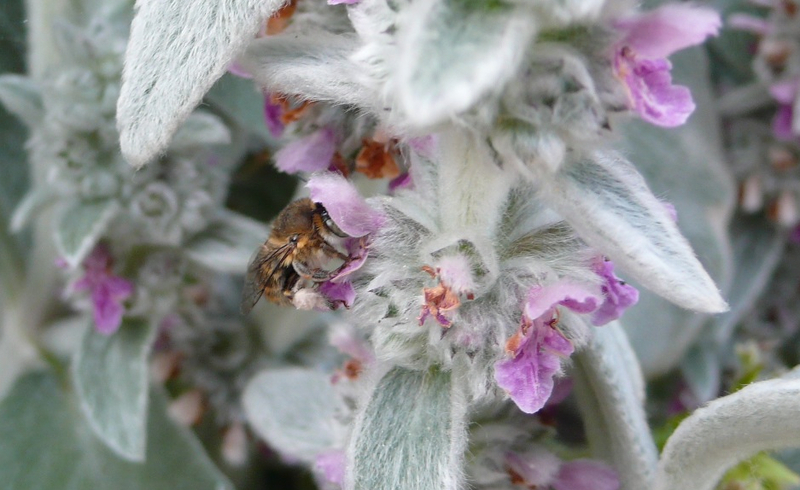 One of those posts was of what I believed to be the Little flower bee (Anthophora bimaculata), a species which at the time I’d never previously seen. I noted that this was a new urban record for Northampton as my PhD student Muzafar Sirohi had not recorded it during his bee surveys, which I discussed earlier this year. Some time later I checked the bee records on the National Biodiversity Network (NBN) Gateway site and realised that not only was this the first urban record of the species in Northampton, it was actually the first record for the county of Northamptonshire as a whole! The record has recently been accepted on iRecord and will be added to the NBN records. Of course this is personally exciting (a new record for a large county found in our back garden) and it adds a significant regional record to the currently known distribution of the species. The map on the BWARS account of Anthophora bimaculata shows that the species is predominantly southern in its distribution, with a few eastern and western outliers. This new record places the species firmly in the centre of England, confirming that it is more widespread than previously assumed. 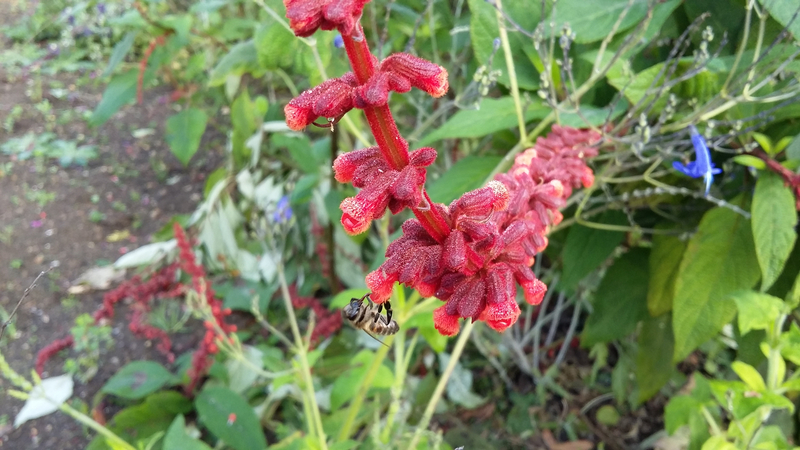 There are two possible explanations for the discovery of this bee in Northamptonshire. One is that it’s a very recent range expansion and the species is becoming more common and widespread, perhaps as a result of climate change. The second is that it’s always been present in Northamptonshire, but just never recorded. At the moment it’s impossible to decide between these two possibilities as there’s evidence to support both. Not only did Muzafar not record A. bimaculata in his surveys in 2012, neither did Dr Hilary Erenler, Dr Sam Tarrant or Kathryn Harrold in their pollinator surveys in the region between 2007 and 2015. Having said that, we do know that Northamptonshire is a historically under-recorded county for bees as it has no County Recorder for Hymenoptera, and both Hilary and Muzafar recorded species new to Northamptonshire, which I hope to report on at a later stage. Differentiating between these two scenarios will be difficult and may be impossible unless we can discover previously unknown historical specimens of this bee that were collected in the county, or the species continues to expand in its range. Understanding the distribution of pollinators such as bees is a key component of initiatives such as the National Pollinator Strategy – if we don’t know where the things we are trying to conserve actually are, how can we conserve them? So it’s very pleasing to be able to make a small contribution to that process from the comfort of our own garden!